In this commentary, Dr James Robar (Nova Scotia Health Authority, Canada) discusses combining 3D printing technology with patient image data to improve accuracy and efficiency of radiation therapy. In this commentary, Dr James Robar discusses combining 3D printing technology with patient image data to improve accuracy and efficiency of radiation therapy. James Robar PhD, FCCPM is the Chief of Medical Physics at the Nova Scotia Health Authority and Professor of Radiation Oncology at Dalhousie University, both Halifax, NS, Canada. Dr Robar divides his time between clinical practice and research, with interests in image guidance technology in radiation oncology, dose enhancement using gold nanoparticles and applications of 3D printing technologies. He is the author of over 30 scientific articles and holds multiple patents related to advancing the state-of-the art of radiation therapy. Dr Robar completed his Doctorate in Medical Physics at the University of British Columbia (Vancouver, BC, Canada) and clinical residency in oncology physics at the BC Cancer Agency (BC, Canada). External beam radiation therapy (RT) is a focal technique used in the treatment of cancer with an optimal utilization rate of approximately 52% . For the patient, the process involves undergoing CT and, in some cases, MRI and PET imaging, followed by treatment in a fractionated regimen, whereby the full radiation dose is delivered daily over 1 to 7 weeks, depending on the indication. Most commonly, radiation is administered by a clinical linear accelerator which accelerates electrons to close to the speed of light and generates therapeutic electron or x-ray photon beams. For many indications of RT, the therapeutic ratio is low, meaning that the radiation dose required to kill cancer cells, if delivered to normal tissues, may also cause toxicity. Therefore, the efficacy of RT hinges critically on the achievable spatial accuracy and precision of the approach, as well as the capacity of the technology to shape radiation dose distributions which conform to tumor volumes. The suite of tools available to address these goals includes imaging systems providing detailed 3D views of the patient anatomy as well as the functional characteristics of the tumor and its environment. Multiple image datasets are co-registered in a sophisticated computerized treatment planning system to establish a detailed 3D model of the patient which informs the design of a treatment plan involving multiple beams or beam arcs converging on the tumor volume. The planning system is often equipped with optimization routines which generate beam geometries or patterns of radiation intensity that achieve specified clinical goals for target coverage or sparing of specific organs. When a treatment plan satisfies clinical objectives and is approved by a radiation oncologist and medical physicist, all parameters are relayed to the clinical linear accelerator, which is capable of delivering electron or x-ray beams on the order of 60-times more energetic than an x-ray beam used for x-ray imaging. The linear accelerator itself is equipped with onboard image guidance systems, enabling in situ imaging to verify the accuracy of patient positioning prior to turning on the beam. On some treatment platforms robotic systems allow real-time tracking of tumors that move during treatment. These remarkable technologies employed in the planning and delivering of RT are among the most complex in healthcare today. However, some steps of the procedure have remained conspicuously manual, decidedly low tech, and in certain cases, limited with regard to accuracy. An example is the use of a device placed on the surface of the patient during treatment called a bolus. Conventionally, a bolus consists of a layer of material, for example, a sheet of rubber-like material 0.5 to 1.0 cm in thickness, covering the skin over the area of incidence of the radiation beam. The necessity of bolus arises from the basic physics of x-ray photon or electron beams – when a beam is incident on tissue, the maximum dose does not occur at the surface, but rather, up to several cm below the skin. Placement of bolus on the patient thus enables the radiation dose to ‘build up’ in the bolus material rather than in the patient, allowing the maximum dose to be delivered at the patient surface at the location of the superficial tumor. A bolus is needed for a diverse range of applications in RT, including for the treatment of skin cancer, the chestwall of patients who have received a mastectomy or superficial lymph nodes containing disease. Status quo methods for boluses have persisted since the inception of RT with megavoltage radiation beams. Although the use of a simple sheet of rubber-like material is nearly ubiquitous, it involves several shortcomings. First, the accuracy is limited, given that the contour of a patient may be complex, and sheet boluses fail to conform to undulations on the surface. Consequently, air cavities are introduced between the bolus and the skin, which causes a significant reduction in the desired dose at the skin  in an unpredictable fashion.In order to achieve a better fit of the bolus, RT staff may attempt to force it into or around irregularities, for example, using adhesive tape and rolled linens. Alternatively, staff may invest considerable effort to fashion a bespoke device, e.g., based on a mold of the patient. Indeed, RT clinics often include facilities resembling arts and crafts studios, equipped with plaster, thermoplastics and wax. This manual process is inefficient, requiring significant time on the part of the staff and patient, ties up physical resources such as the CT scanner and is discordant with the rest of the RT process, which is increasingly automated and digital. In some cases, the manual molding of a material to the patient may be an uncomfortable experience, for example, where the patient has undergone previous surgery. Finally, even if the bolus fits well to the patient at the beginning of treatment, the patient’s anatomy may change over the course of therapy due to tumor regression, edema or weight-loss, necessitating generation of a brand new device. From a resource perspective, this amplifies the impact of inefficient processes for producing and fitting boluses. Enter 3D printing technology, which, when combined with a wealth of imaging data already present in the RT paradigm, introduces new and powerful options. Figure 1 shows three exemplary devices designed and produced at Dalhousie University in Halifax, Canada.The first (Figure 1, left) is a chestwall bolus, used in conjunction with x-ray photon beam therapy. This device can be defined within the treatment planning system based on the patient’s CT data. Once the shape and thickness are specified based on the outer contour of the patient, the treatment planner simply exports the bolus object to software that prepares the data for production using a Fused Deposition Modeling (FDM) 3D printer. The bolus is generated at the push of a button, completely alleviating the need for manual methods, as well as the presence of both the staff and patient. Although the FDM method is not known for its speed, in our facility a bolus is typically printed overnight, which is acceptable with respect to the overall time frame for treatment preparation. The chestwall bolus may be printed using polylactic acid (PLA), which, when printed in solid form, is similar to tissue with regard to depth dose characteristics . Well-characterized differences between PLA and tissue are accounted for explicitly in treatment planning by specifying the actual electron density of the bolus. Additional options are available with regard to printable media, including semiflexible or highly flexible filaments, which may allow advantages, e.g., in the presence of slight patient motion. Since the 3D printing infill factor (i.e. fraction of the solid volume filled with medium) is customizable, the average density and therefore surface dose may be controlled by the practitioner, which introduces a previously-unavailable degree of freedom. Finally, since the bolus design can be enhanced prior to 3D printing, additional features may be added such as crosshairs to facilitate alignment on the patient and relative to the linear accelerator. In our facility, we also incorporate pockets for embedding of in vivo optically stimulated luminescent dosimeters – detectors just a few millimeters in dimension that allow monitoring of the delivered dose during the course of therapy, thereby providing a ‘built-in’ quality assurance measure. Figure 1. Exemplary 3D printed devices used in radiation therapy. The second device (Figure 1, middle) is a ‘Smart Bolus’, which not only conforms to the patient at the skin surface, but features a customized shape on the upper surface, which allows Modulated Electron Radiation Therapy. Employing patented algorithms developed by our group  that leverage Monte Carlo dose calculations from the treatment planning system, this device presents variable bolus thickness to the incident electron beam, causing a variation in attenuation and mean energy, which in turn sculpts the 3D distribution of dose deposited below the bolus. In this example, beyond ensuring an accurate fit to the patient, the technology introduces new potential with regard to the ultimate goal of RT delivery, i.e., confining the radiation dose volume to the tumor (Figure 2). Figure 2. Radiation therapy using a MERT bolus verses standard treatment. For electron therapy, the 3D printed bolus has a customized shape based defined by algorithms in , allowing the prescription Isodose to conform to the PTV, thus sparing normal tissues. 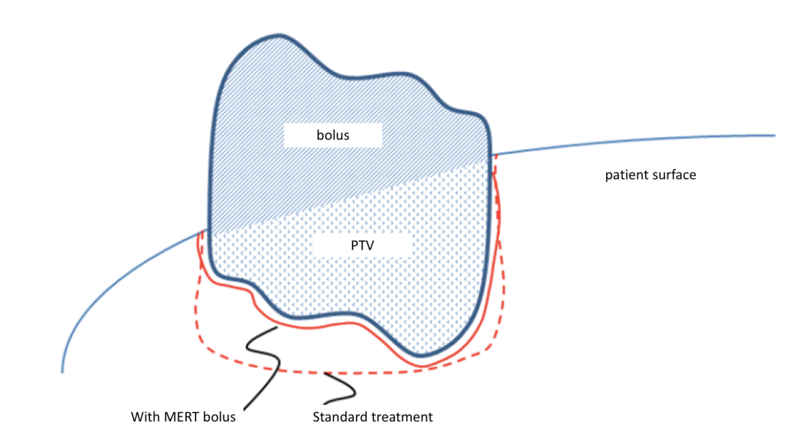 MERT: Modulated Electron Radiation Therapy; PTV: Planning Target Volume. Figure 1 (right) shows an example of a device that is not a bolus, but rather an immobilization device used during RT of the intact breast. Immobilization of the breast during therapy can be important, given that detailed treatment plans are based on a CT ‘snapshot’ of the patient, the breast is highly mobile, and the treatment plan must be administered over 16 to 25 fractions. Inconsistency of the setup of the breast from day to day can cause an unpredictable variability of the delivered dose relative to the treatment plan. The objective in this scenario differs from the previous two examples in that the goal is deposition of dose within a more deeply-seated volume of breast tissue rather than at the surface; in fact, the beam’s skin-sparing effect should be preserved, since limiting the skin dose will reduce acute toxicity including erythema and desquamation. In this application, the structure of the 3D printed immobilization device is the key – the mesh immobilization, designed directly from the patient’s CT data, is printed using a highly rigid medium which is entirely hollow in cross section. Minimizing the material in the path of the beam limits the skin dose and therefore the associated acute toxicity. This is an example of a device that would be difficult, if not impossible, to produce with subtractive manufacturing. While the three devices in Figure 1 can be produced in an automated fashion using a set of algorithms that operate on the patient’s CT imaging, other applications require more interactive and customized manipulation of the data. For example, Figure 3 shows a bolus produced for a patient with a recurrent cancer on the nasal septum. In this case, both nasal passages needed to be filled with bolus to achieve sufficient dose to the gross tumor volume. The bolus was designed based on the patient’s post-surgery CT, then bisected along the sagittal plane. A key was printed to allow left and right halves to be snapped together. Figure 3 (right) shows the treatment planning CT (top) and a cone-beam CT image taken using the linear accelerator image guidance system (bottom), confirming excellent fit of the bolus and minimization of air cavities. An interesting practical aspect of this application is that the bolus may be produced even before the visit by the patient to the radiation oncology clinic using data retrieved from the image archive system. For the patient, the process represents a substantial improvement in experience: the status quo method in this scenario would have been packing of wax in the nasal passages, which would have involved daily discomfort and a likely degradation of the bolus over the 30 fractions of treatment. Figure 3. Treatment planning and guidance system CT images for radiation therapy for a tumor on the nasal septum. 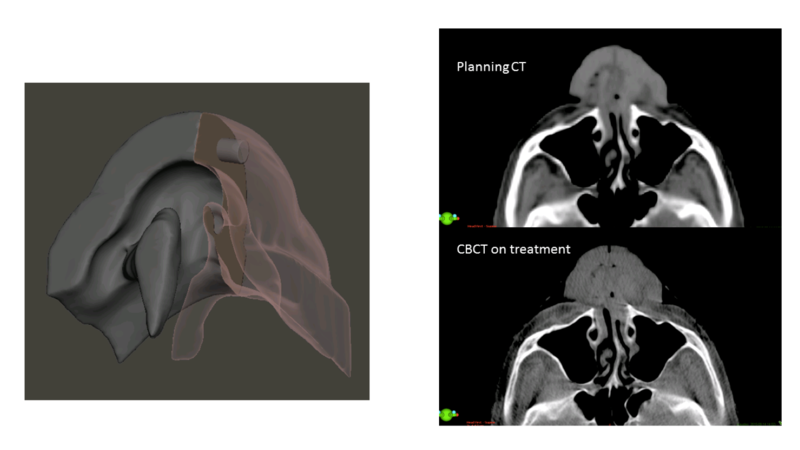 Design of a bolus for nasal passages based on patient’s post-surgery CT (left).Confirmation of fit of bolus using the treatment planning CT (right, top) and during the course of treatment using image guidance on the linear accelerator (right, bottom). Given that the methods described above offer the potential for improved treatment accuracy and efficiency, they are already underway in the Nova Scotia Health Authority and at other early-adopting centers around the world. In our facility, an inhouse study is in progress, focused specifically on assessing the improvement of spatial and dosimetric accuracy of 3D printed chestwall boluses with direct comparison to standard sheet boluses.It is anticipated that the results of this study will motivate a complete replacement of the status quo approach. The examples described above represent natural applications of 3D printing to the radiation oncology process and also address some of the most frequent indications for RT, for example, treatment of breast and skin cancer with curative intent. Future applications of 3D printing to RT are foreseeable.For example, patient-tailored 3D printed devices may enhance existing methods in high dose rate brachytherapy , which involves delivering radiation to a tumor via a radioactive source (Iridium-192) guided by a wire within a catheter inserted interstitially, into cavities or on the surface of a patient. Figure 4 shows a 3D printed brachytherapy surface mold, designed by researchers at Dalhousie University, using a flexible material in the treatment of skin cancer of the nose. Similar to the external beam RT examples above, the mold is derived from CT image data already available for treatment planning purposes. In this context, 3D printing presents advantages since the printed mold conforms well to the patient, which is essential in controlling the delivered dose, and the catheter trajectories can be optimized to improve the dose distribution. Figure 4. Standard and novel methods for surface brachytherapy of the nose. 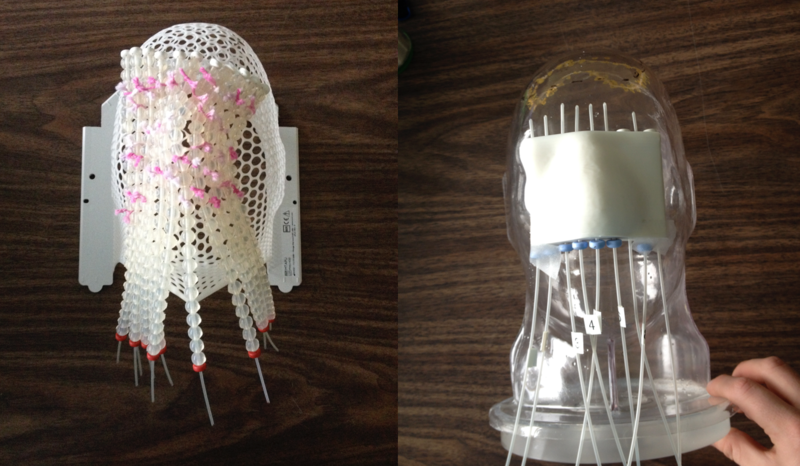 Standard methods may involve, for example, manual sewing of catheters to a mask fitted over the patient (left), a laborious task offering limited control over the distance from the catheter to the skin.3D printing allows design and automated fabrication of a surface mold with embedded catheter trajectories (right) that optimize the dose distribution. Additional applications will likely follow the emergence of novel printable media. For example, investigators at the University of Minnesota (MN, USA) demonstrated that when a 3D printed bolus is produced using a printable composite containing copper, the required thickness can be reduced dramatically . In this study, a 0.4 mm thickness of copper-containing PLA / polyhydroxyalkanoate was required to yield a surface dose equivalent to that given by 2.5 mm PLA.The reduced thickness allows the bolus to be flexible and may be produced more quickly using FDM.Other applications of printable metallic media are possible, including, for example, customized shielding in the context of electron beam or superficial x-ray therapy. Finally, it has been demonstrated that some 3D printable materials scintillate in response to absorption of ionizing radiation. Mishnayot et al. , for example, produced a medium compatible with stereolithographic printing, achieving 30% efficiency compared to standard commercial scintillators. Printable scintillators may allow patient specific devices, such as the bolus or immobilization described above, that inherently serve the function of an in vivo, real time dosimeter. In summary, 3D printing technology is generating excitement in radiation oncology practice with regard to supplanting longstanding manual methods, while offering the potential for improved accuracy and efficiency. The technology integrates smoothly into the RT process given that it leverages image data already available. A range of printable devices is possible, including photon boluses, boluses enabling modulated electron therapy and patient immobilization that reduces skin dose.As the state of the art of 3D printing advances, additional innovation in RT will follow. Images in Figures 1–3 provided by James Robar. Images in Figure 4 courtesy of Dr Mammo Yewondwossen, Associate Professor, and Scott Clarke, MSc Medical Physics candidate, Dalhousie University. Delaney G, Jacob S, Featherstone C, Barton M. The role of radiotherapy in cancer treatment. Cancer 104(6), 1129–1137 (2005). Butson MJ, Cheung T, Yu P, Metcalfe P. Effects on skin dose from unwanted air gaps under bolus in photon beam radiotherapy. Radiat. Meas. 32(3), 201–204 (2000). Burleson S, Baker J, Hsia AT, Xu Z. Use of 3D printers to create a patient-specific 3D bolus for external beam therapy. J. Appl. Clin. Med. Phys. 16(3), 5247 (2015). Su S, Moran K, Robar JL. Design and production of 3D printed bolus for electron radiation therapy. J. Appl. Clin. Med. Phys. 15(4), 4831 (2014). Garg A, Patil S, Siauw T et al. An algorithm for computing customized 3D printed implants with curvature constrained channels for enhancing intracavitary brachytherapy radiation delivery. Presented at: 2013 IEEE International Conference on Automation Science and Engineering (CASE 2013). Madison, WI, USA, 17–20 August 2013. Vitzthum L, Ehler E, Sterling D, Reynolds T, Higgins P, Dusenbery K. SU-C-213-05: evaluation of a composite copper-plastic material for a 3D printed radiation therapy bolus. Med. Phys. 42(6), 3189–3189 (2015). Mishnayot Y, Layani M, Cooperstein I, Magdassi S, Ron G. Three-dimensional printing of scintillating materials. Rev. Sci. Instrum. 85(8), 085102 (2014).